The warmth of the cinnamon and the dried mint turns this pasta bake into something distinctively Cypriot rather than Italian. Serve it with a big Greek salad on the side for a stress-free dinner party. 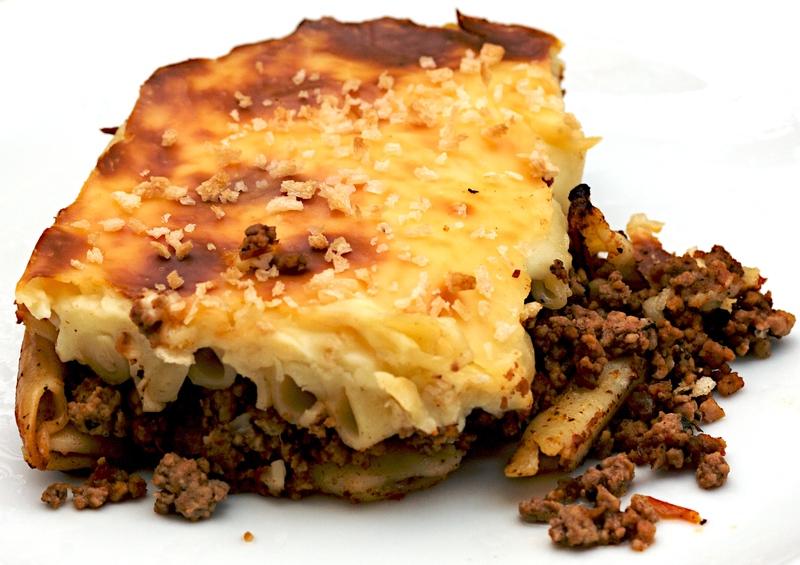 The Pastitsio takes a while to make but you can have all assembled in advance, ready to stick in the oven when your guests arrive. It is also best served warm, or even at room temperature, so you don’t need to worry if you get behind making your salad! Tessa recommends a dish of dimensions very similar (and no bigger) than this: 35cm long, 24cm wide and 6cm deep. We used a big roasting tin. Heat the oil in a large non-stick saucepan and fry the onion until soft and golden. Add the parsley and garlic and cook for a few second before adding the meat. Fry for a few minutes until all the moisture has gone and the mince is starting to brown. Season and add the bay leaf and cinnamon. When it starts to fry and brown, add the wine and cook until evaporated. Add the tomatoes and a cup of water and cook over a medium to low heat for 10-15 minutes. The meat shouldn’t be too dry. Take off the heat. Preheat the oven to 180°C (350°F/Gas 4). Cook the pasta in boiling salted water for 2 minutes less than what it says on the packet. Drain and put in a bowl. Mix in the butter and crumble in the dried mint. Stir well and spoon half over the base of a large ovenproof dish. Pour the meat mixture over the top to evenly cover the pasta, then add the rest of the pasta over the top. Press down with a wooden spoon to make it quite compact. Set aside while you make the béchamel sauce. Melt the butter in a saucepan. Stir in the flour and cook for a few minutes, stirring all the time, then start adding the warm milk. Work quickly, stirring while adding ladlefuls of milk as each one is absorbed. When the sauce is smooth and not too stiff, add salt, pepper and a grating of nutmeg. Keep cooking even after it comes to the boil, for about 5 minutes, stirring all the time. You should have a very thick and smooth sauce. Pour this over the pasta and meat in the dish. Sprinkle the breadcrumbs over the top and bake for 30-40 minutes until the top is golden. Let it cool for a bit before you serve or it will run everywhere.